We have been hearing rumors that Samsung are about to launch a new version of the Samsung Galaxy S4, the device is now official and is called the Samsung Galaxy S4 LTE-A or Galaxy S4 LTE Advanced. According to Samsung the Samsung Galaxy S4 LTE-A is the worlds first LTE Advanced smartphone, and as we reported previously it comes with the new Qualcomm Snapdragon 800 quad core processor with a clock speed of 2.3 GHz. The Samsung Galaxy S4 LTE-A also features 2GB of RAM and 32GB of built in storage, there is also a microSD card slot which can take up to 64GB cards. The handset features a 5 inch full HD Super AMOLED display with a resolution of 1920 x 1080 pixels at 441 PPI, this is the same display that is found in the original S4. Other specifications on the S4 LTE Advanced include WiFi HT800, Bluetooth 4.0 LE and NFC, the device also comes with a 2,600 mAh battery and front and rear facing cameras. 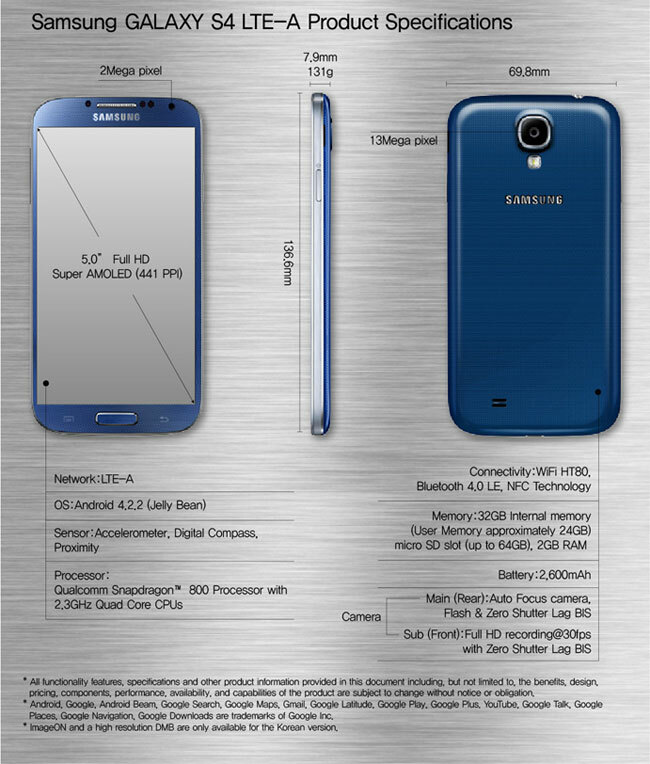 On the front of the Samsung Galaxy S4 LTE Advanced is a 2 megapixel camera for video calls, on the back of the device is a 13 megapixel camera for photos and video. Samsung’s introduction of the GALAXY S4 LTE-A, the world’s first LTE Advanced-capable smartphone, is the latest expression of the company’s efforts in leading LTE technology. Samsung’s commitment to driving LTE adoption achieved its first milestone in 2010 with the launch of the Craft, the world’s first LTE feature phone, and continued in 2011 with the delivery of the Indulge, the world’s first LTE smartphone. In the last year, Samsung has also pioneered efforts to bring VoLTE network capabilities to users with the launch of the GALAXY S III LTE. 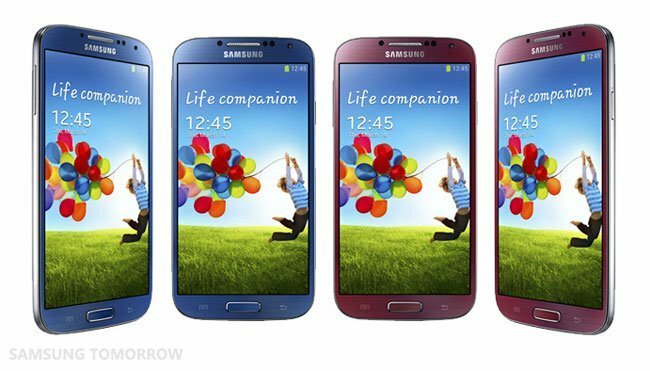 Samsung have said that the Samsung GALAXY S4 LTE-A will launch this summer in South Korea in two colors, blue and red, they have not given any information on when the device will be available in other countries.